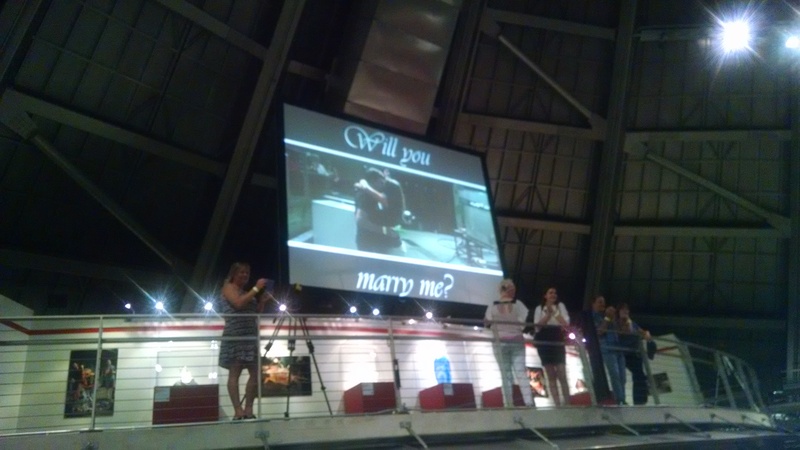 The summer of 2015 was a busy time at Museum of Glass (MOG) for wedding ceremonies, receptions, and marriage proposals. MOG is a popular site for weddings with an outdoor ceremony followed by a reception in the Grand Hall. Each outdoor event brings a period of weather anxiety on the days leading up to the wedding, as the lucky couple hopes for perfect conditions on their big day. In 2015, we had a wide range of conditions; from heat waves where we had to take the wedding indoors, to a wedding that concluded just minutes before it started raining. 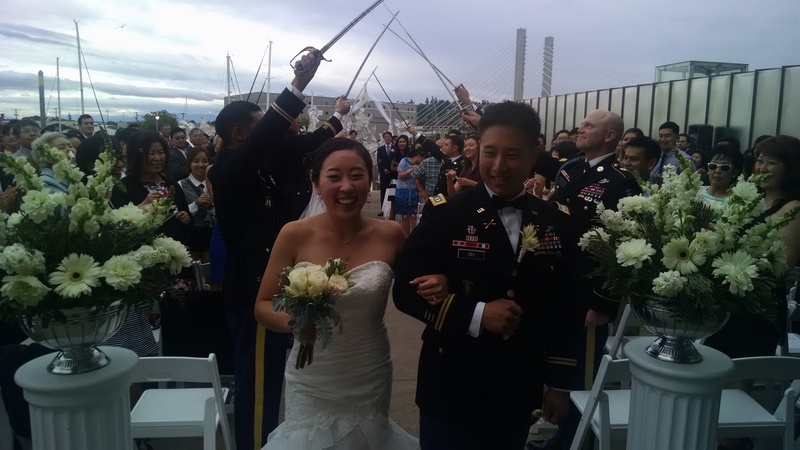 August 8 brought the wedding of Alice Yi and Michael Oh to the lower plaza near the Fluent Steps installation. Michael is an officer at nearby Joint Base Lewis-McChord (JBLM), and their dramatic ceremony had them walking under the drawn swords of other officers from JBLM. On September 2, Dan Rattenbury got down on one knee on the Hot Shop floor to propose to his girlfriend. MOG emcee Walt Lieberman was in on this elaborate arrangement to surprise her and have the proposal happen during their visit to the Hot Shop. Dan had an idea that centered around the notion that his girlfriend was like a unicorn – a mythical being and, like a unicorn, too good to be true. A month before their visit, he had the Museum’s Hot Shop Team make a unicorn out of glass. The mythical glass creature was then carefully wrapped in advance as a grand prize for the person who could answer a trivia question on the day of their visit. Dan supplied our emcee with a question that only his girlfriend could answer. When she answered the question correctly she was then invited down on the Hot Shop floor to retrieve her prize. 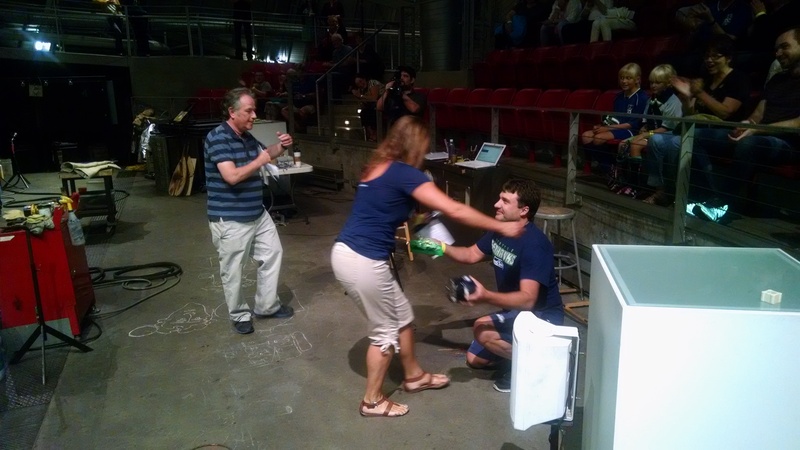 Once she opened the box, Dan then asked her to marry him and she said yes! Looking on from the audience were friends and family along with the other Museum visitors. Congratulations Dan! This entry was posted in Events, Hot Shop, Museums, Weddings and tagged Hot Shop, JBLM, Joint Base Lewis McChord, Marriage proposal, Museum of Glass, Proposal, Unicorn, Wedding season, Weddings on October 16, 2015 by Museum of Glass.